Taoist Light wellness wishes everyone the most happy and peaceful New year of pig. May your life be filled with blessings, health and cultivation success! Welcome anyone who is interested in art or meditative concentration to Taoist Light Wellness Center for tea-ceremony and Caliigraphy training. we use the highest quality of aged Pu- Erh in small orange peel for supporting spleen and lung Qi (contains mild caffeine). Other non-caffeinated tea is also available. We will also learn how to use soft brush and ink on rice paper to write our Chinese names based on the pronunciation of your English name. This session is happening on the first Saturday of each month 2-3:30pm, $30. Please call or text to sign-up. Group practice can help people keep on the practice track and practice correctly and successfully. After each group practice session, we gather and sit in silence and call for group Qi healing (Zu Chang). Group practice and healing is held on every Thursday 10-11:30am and Saturday 4-5:30pm, $30/per session only for people who have received the Taoist Light Qigong level I training. There is a term in Chinese Qigong practice called Wei Qi, means protective energy. It originates from spleen and stomach, nourishes the internal organs and skin, and covers all around our body. Some people have the transcendental ability to see this part of energy which is invisible for most others. Just because it is invisible, it does not mean it does not exist. It is like electricity or virus, it can be detected or seen through devices. Wei Qi is the shield to protect our body from any abnormal attack, and protect cells, body fluid. so as to improve phagocyte and humoral immunity. When the skin is soft, smooth and shining, this usually indicates that Wei Qi is in good shape. Why is Wei Qi so important? Because without this, one can become vulnerable and prone to illness. When Wei Qi is in its strongest state , one is happy, content, and at ease; on the contrary, when Wei Qi is weakened, one is under stress, fatigue, and depression. The best protective energy can be generated by daily Qigong practice Once the mind and body in harmony, the Wei Qi grows to its strongest, then one can be reach to a state called 五毒不侵, which means poisons cannot get through your body. Greetings from Taoist Light Wellness! I wish everyone a great year of 2019 filed with love, light, good health and happiness! I would like to welcome you to I-Ching (also known as King-wen) Qigong one-day retreat. To set a new life direction, to reach a higher level in self-cultivation, and to create harmonious relationships in the earthly world, the I-Ching (Classic of Change) has been showing the way for the next step for more than three thousands of years. January 12, Saturday 10-4pm. One day intensive training includes guide book, and lunch. Lunch: Taoist Light Wellness will provide lunch for you or you can choose to bring your own lunch. Look forward to a great day with you! We are going to hold Taoist Light Qigong Level II — I-Ching Qigong training/retreat on Saturday, January 12, 2019, from 10-4pm. 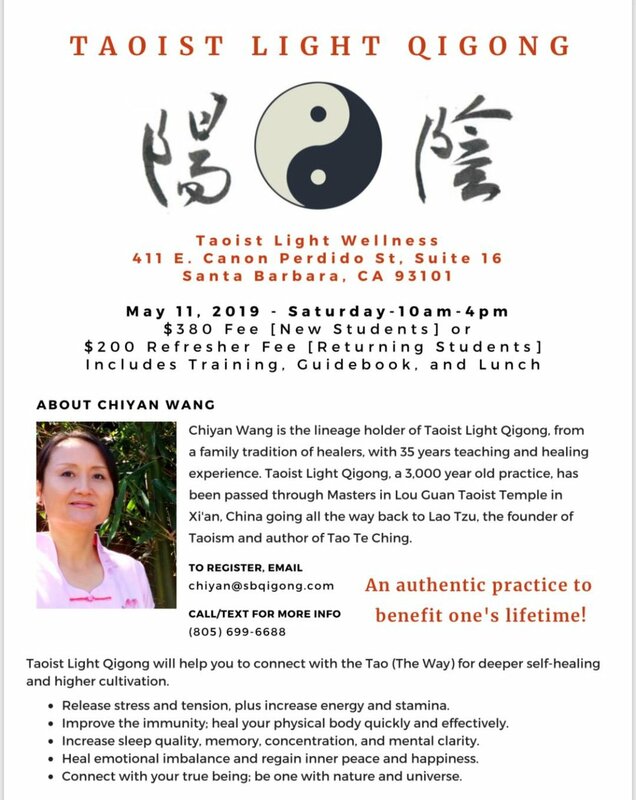 This workshop is only open for participants who have taken Taoist Light Qigong Level I training.